The duo has clocked a lot of studio time recently, perfecting that sound for a two-song release titled 03 they plan to drop in the summertime. The record, they say, is a vocally driven fusion of R&B and pop. Musical inspiration: The twins, both 26, have spent countless hours listening to old-school ’70s R&B and pop. They love Earth Wind & Fire, Stevie Wonder, Michael Jackson and The Gap Band. “[The Gap Band] is very melodic and they have a lot of groove in whatever they do,” Torrence says. Their style: “I think I’m dressing more urban, in a way, than I used to. Before, I was maybe a little more dressy, but now my pieces are a little bit more relaxed. I’ve gotten rid of a lot of stuff. I pay more for quality now so I can wear pieces over and over again,” Thurman says. The twins both agree that they love to mix simple T-shirts with edgy details like sleeveless jackets and outerwear with zippers on the side. Swetman wears her own ’60s-style black shirt and pants paired with a statement necklace from Time Warp. She found her rings and layered necklaces at various estate sales. Anselmo wears a rockabilly-style denim shirt from Time Warp paired with his own jeans and leather belt. 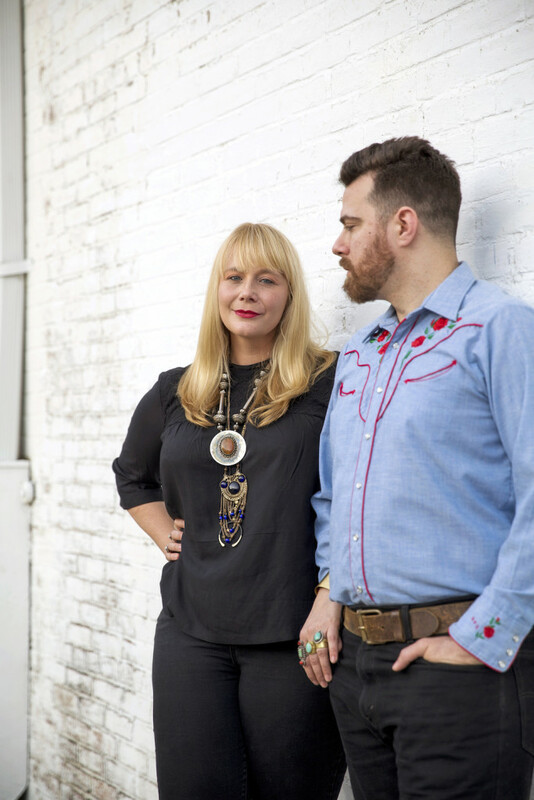 Their music: Katie Swetman and Sam Anselmo front the indie folk-rock duo Palomino Darling. Swetman, 38, sings and plays guitar and bass, while Anselmo, 39, plays guitar, bass and drums. Musical inspiration: Anselmo grew up listening to his dad’s record collection, which included Crosby, Stills, Nash & Young. Swetman grew up listening to Joni Mitchell, too, but has felt more deeply connected to the artist since she began performing and writing songs for Palomino Darling. Anselmo tries to keep his style minimal. “He does a lot of denim on denim,” Swetman says. Monaghan wears a jewel-toned ’60s-style pleated dress with cropped bell sleeves from Time Warp with her own white tights, sunglasses, bangles and rose gold pumps. Her music: It’s all happening for Ashley Monaghan and her band Ship of Fools. They’re preparing for a self-titled debut album release in May and an East Coast tour this summer, when they’ll take their unique music beyond Louisiana. Musical inspiration: Monaghan grew up dancing. Her love for jazz and R&B runs deep, and she cites Frank Sinatra, Elvis Presley, Ella Fitzgerald, Etta James, Stevie Nicks and Peggy Lee as some of her favorite artists. She’s particularly inspired by the ’60s, when music and style both became more vibrant than ever. Her style: Monaghan wakes up every morning truly excited to get dressed. Onstage, she rocks sequins, suede, metallics and bold colors. Her spirited style is balanced by her bandmates, who typically dress in neutrals. But while she admits that she buys a lot of her pieces with the stage in mind, she says the way she dresses onstage and off is really not that different. You won’t catch this LSU student in workout gear, even when she’s going to class. “I’m so much more interested in a well-fitted high-waisted jean or a fun patterned short or velvet,” she says. Monaghan incorporates her love of style into her professional career in another sense, too: She does fashion styling for brands and designers and has also been involved in the Southern Coalition of Fashion & Design for the past several years. See her perform: Catch Monaghan and Ship of Fools live at LSU’s Groovin’ on the Grounds this month. Concert date had not been announced at press time. Check students.lsu.edu/groovin for updates. Vintage clothing and styling assistance provided by Time Warp.